Suffering from a cramped office space? The solution is here, at least in the USA. Don’t downgrade to a tiny but weak laptop when you can minimize your computer while keeping your monitor as large as you need it to be. Mini PCs are radically small, but are jam-packed with power. These new units are taking portability to a whole new level. You can now carry around your PC with you, making almost any screen your computer monitor. Save not only space, but also energy and money with these extremely effective and efficient models. Infocus Kangaroo PCs come in three very models in the USA: Kangaroo PC, Kangaroo+ Mini PC, and Kangaroo Pro PC. All are durable and sleek with an aluminum finish. Windows Hello uses a fingerprint reader to securely log you in and things only get more impressive from there. Infocus Kangaroo PCs uses Windows 10 to its full potential. The software can be projected onto any screen including iOS devices. Both desktop and tablet modes are enabled and users can remotely access the device without a router. Extra storage can be added using the microSD slot and with OneDrive, you’ll never be without your documents and files. The original Kangaroo PC and Kangaroo+ Mini PC are 1/3 the weight of a typical tablet and as thin as a package of post-it notes while the Kangaroo Pro PC is slightly bulkier. The main difference between the Kangaroo PC and Kangaroo+ Mini PC is that the former has 32GB of storage while the latter boasts 64GB allowing for more programs. 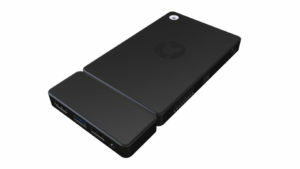 The Kangaroo Pro PC on the other hand has the flexibility to connect with even more devices and store more by adding a hard drive. 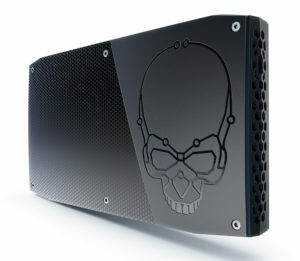 The Intel® NUC Skull Canyon comes with all the latest updates. 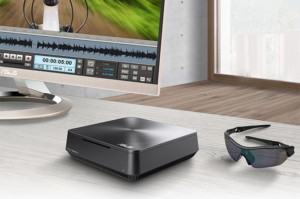 The redesigned Intel® NUC Kit NUC6i7KYK comes equipped with the 6th generation Intel® Core™ i7 processor and Intel® Iris™ Pro Graphics, maximizing performance for game play, movies, music, editing, and heavy workloads. The 3D graphics on this tiny computer are 30x better than the last model and uses a thunderbolt cable, which gets four times the data and twice the video bandwidth as other cables. The Intel® NUC Skull Canyon also has support for up to 32 GB of RAM and an Intel® RealSense™ making most anything possible. With all this power, the computer provides the user with an optimum Windows 10 experience on up to 3 monitors at once. Four USB 3.01 ports, including a charging port, allow for multiple accessories. Rather go wireless? The PC is also equipped with Bluetooth. Additionally, a redesigned lid and chassis allow you to take full advantage of every GHz of the quad-core processor without overheating. Asus is constantly coming out with new and improved models of the Asus VivoMini in the USA. One of the current models, VivoMini VM65N, uses 6th generation Intel® Core™ ‘Skylake’ and DDR4 RAM for exceptional performance. This update has allowed for an 11% performance boost over the previous generation. The Asus VivoMini allows for smooth multitasking on a Windows 10 platform that can be accessed remotely from any smart device. It also uses NVIDIA® GeForce® graphics for 4k UHD visuals and casual gaming and an Intel® 802.11ac Wi-Fi card and ASUS Media Streamer for 4K UHD streaming. Like its contenders, the Asus VivoMini also supports up to three independent displays through HDMI and DisplayPort++. Integrated speakers with SonicMaster Technology-enhanced audio serve as an added bonus. This Mini PC is perhaps the most customizable of the bunch. The compact VESA-mount-compatible design lets users create their own custom all-in-one PC and the Vivo DualBay accommodates up to two storage drives. The chassis is also designed to easily slide open for hardware upgrades. 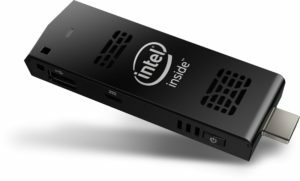 The Intel Compute Stick is most definitely the smallest in the bunch, being about the size of a pack of gum, but don’t let the size fool you. This stick, once plugged in, transforms any HDMI TV or display into a complete computer. In that tiny black box is hidden up to 4GB memory and 64 GB of on-board storage thanks to either Intel Atom™ or Core™ M processors. These Sticks are available with a range of Intel processors in the USA so that you can pick the one that best fits your personal needs. Also hidden inside is a tiny cooling fan, so overheating is not a problem. Other tiny features include a security notch, a USB port, a power port, a MicroSD card slot, and Bluetooth capabilities. Though these Mini PCs are ultra convenient, getting ahold of them in your country might not be. Why wait any longer than you have to when there is a concierge service with efficiency and convenience matching these products? 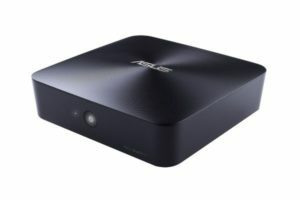 Consider using Big Apple Buddy to get your hands on one of these game changing Mini PCs now rather than much later. Learn more about our service or get a free shipping quote for a Mini PC today!